This document breaks down the use of BSP in level creation. For a run-down on creating levels, please see the Creating Levels page. BSP Brushes are the most basic of the building blocks in Unreal. Conceptually, it is best to think of BSP as carving out and filling in volumes of space in your level. BSP was once used as the primary building block in level design, but now more efficient and differently specialized geometry types have been introduced. However, BSP can still be useful in the early stages of a product, for rapid prototyping of levels and objects. This doc goes over what BSP can be can be used for as well as explaining how to use it. Technically, BSP (Binary Space Partitioning) refers to a data structure that is used to organize objects within a space, and thus it is not semantically correct. A more accurate term for this type of geometry would be CSG (Constructive Solid Geometry). However, the terms BSP and CSG are used interchangeably so just keep that in mind if you come across either of these terms in other docs or in conversation around the water cooler. Also note that how BSP works is slightly different from how it used to work in previous versions of the Unreal Engine. Previously, an empty level was a solid space - in effect an additive space. Now, the level starts out as a subtracted space. What this means is that you no longer need to start out with an initial subtraction when creating your level. The first step is to first block out the level to nail down the layout and flow before putting any time into populating the level with static meshes and other finished art assets. This is usually done using BSP to create a shell for the level and then, through testing and iterating, the final layout is agreed upon. BSP is perfect for this aspect of the level design process because it doesn't require any time or involvement from the art team. The level designer can simply use the tools built into UnrealEd to create and modify the BSP until they are happy with the layout and the way the level plays. Volumes are invisible geometry that define a certain space, usually enabling some special functionality when the player is within the area designated by the volume. The area of a volume is defined by a BSP brush. This enables the designer to easily create effects localized to a given portion of the map, such as swimmable areas, collision, triggers, or even modifying post process effects. For more information on Volumes, see the Using Volumes page. Often, when a level designer is creating their level, they will come upon a situation where they need a fairly simple piece of geometry to fill in a gap or space. If no existing static mesh will fill the space, instead of bothering the art team tasking them with creating a custom mesh, the designer can simply use BSP to fill the space. Even though static meshes are better performance-wise, BSP can occasionally be used without any serious impact as long as the geometry is simple. There is a variety of different BSP Brush types you may use throughout the level creation process. Each type is particularly suited to specific situations. The builder brush is essentailly a template which can be modified and then used to create any of the other brush types. This brush can be modified with the transform tools, using Geometry Mode, or with the Primitives in the main editor toolbox. The builder brush can also take the form of any other existing brush using the Polygons > To Brush option in the context menu. Additive brushes are like solid, filled-in space. This is the type you will use for any BSP geometry you wish to add to the level. A good way to visualize an additive brush is to imagine the four walls, the floor, and the ceiling of a room. Each of these would be a separate box-like additive brush in your map with their corners matching up to form an exclosed space. 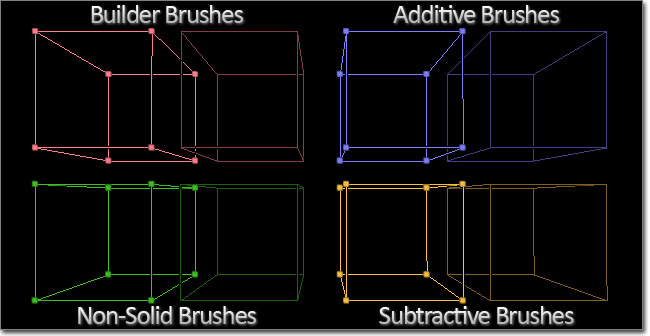 The concepts of additive and subtractive brushes were explained above. These concepts also extend to the level as a whole. The default world space you start with in an empty level is like a giant subtracted space, or an empty void, which you can add geometry into to form your world. Just to make things confusing, this is referred to as an additive level. Note that in previous versions of the Unreal Engine, the default world used to be a solid space that you needed to subtract out a space from. This is no longer the case. It is possible to start with a world which is additive or solid space, referred to as a subtractive level, and then carve areas out of it to form your level, but this method comes with certain caveats and is essentially just filling the empty world with a large additive brush. In general, it is best to start with the Additive level. The drag grid used to snap objects in the world is very important when working with BSP. If the edges or corners of brushes are not set on the grid, errors can occur causing rendering artifacts or other problems. You should always make sure the drag grid is enabled when working with brushes and make sure that you keep the vertices of your brushes on this grid at all times. Sometimes you may place brushes out of order or want to add a new brush that needs to be calculated before an existing brush. Luckily, the order of brushes can be modified as you will see later in the Brush Properties section. Create BSP cuts in the surrounding brushes. Do not create BSP cuts in the surrounding brushes. The de-intersect tool removes all parts of the builder brush that are currently within solid geometry, i.e. an additive brush, leaving only the part of the brush outside the solid space. None of the existing geometry is affected. This is simply an operation performed on the builder brush in preparation for creating an additive brush. The intersect tool removes all parts of the builder brush that are not currently within solid geometry, i.e. an additive brush, leaving only the part of the brush inside the solid space. None of the existing geomtry is affects. This is simply an operation performed on the builder brush in preparation for creating a subtractive brush. You can create the BSP brushes by selecting your primitive, setting the size by right clicking the icon and plugging in numbers into the window that pops up. Then use the CSG buttons to add or subtract the brush. Be careful when subtracting or adding over already existing BSP geometry. To be extra safe you should always Intersect before subtracting and Deintersect before Adding. This will make sure that you do not have overlapping BSP geometry which can confuse the engine. Also note that you can access many of these brush features from the brush file menu. You can modify BSP brushes using several methods, each of which is suited to particular situations and how you wish to edit the brush. The best way way to change the actual shape of a brush is to use Geometry Mode. This editor mode allows the direct manipulation of the vertices, edges, and faces of the brush. It is very similar to working in a very simplified 3D modeling application. For more information about Geometry Mode and how to use it to modify brushes, see the Getting Started with Geometry Mode page. 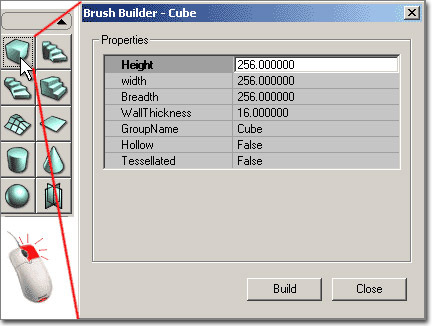 Primitives are used to re-shape the builder brush using predefined, yet configurable, primitive shapes such as a cube, cylinder, cone, etc. For more information on the primitives available and how to use them, see the main editor toolbox page. Existing brushes can be edited by selecting the brush and right-clicking in the viewport to access the context menu. Note that the right-click menu is always accessible, and is context-sensitive, showing different options depending on what you currently have selected in the editor. Snaps the currently selected brush to the grid or a surface as well as providing options for mirroring. Note: Maps built with many BSP brushes will run a lot more efficiently if the brushes are on as large a grid as possible. Allows the pivot about which transformations are performed to be set temporarily. Changes the drawing order of the brushes. This is useful if for some reason you have brushes that have been subtracted and added in the wrong order. For example if you've moved a subtractive brush into an additive one that was added later than the subtractive one. The result would be that you wouldn't see the subtraction. So in this case, you'd hit order->last on the subtract, making it the last brush to draw, therefore making the subtract visible in your level. To Brush - Makes the builder brush the same shape as the brush you have selected. From Brush - Makes the brush you have selected the same shape as the builder brush. Merge - Merges multiple polys on a brush face into as few as possible. The faces must be coplanar, with the same texture and aligned the same for this to work. Separate - Reverses a Merge. You can change a brush from a solid to a semi-solid or non-solid. Now that static meshes are omnipresent in unreal technology games, semi-solids are obsolete. However they still can be useful early on in a project, for getting rid of bsp holes in prototype maps made with lots of BSP brush geometry. 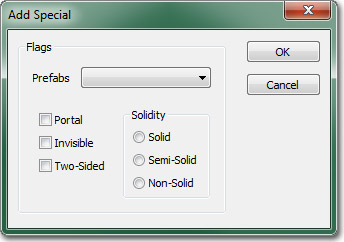 Available when the builder brush is selected, this menu provides an alternative to the Add Volume button for creating a new volume using the current builder brush. Convert To Static Mesh - This allows the user to convert the currently selected brush or brushes to a static mesh. 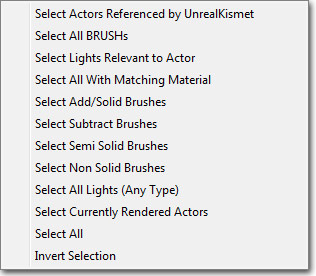 Simply select all of the brushes you want to convert, right-click on one of them (if you right-click on a vertex point, that determines where the origin of the mesh will be!! ), select the option and then assign the new mesh a package, a group (optional) and give it a name. You will then be able to open that package in the generic browser, select the new mesh and then place it in the level with the right-click menu. Convert To Blocking Volume - This will convert the selected brush into a new BlockingVolume, replacing the existing brush. Convert To ProcBuilding - This will convert the selected brush into a new ProcBuilding volume, with the option of deleting or keeping the existing BSP brush. 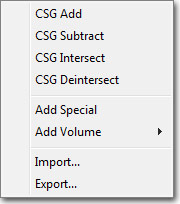 Convert To Volume - This will convert the selected brush into a volume of the selected type, replacing the existing brush. Note: Newly-created static meshes will not have collision unless you assign it to them. If the mesh is simple, you can place it in the map right on top of the brushes that you used to create it. Select the mesh & all of the brushes, right-click, and select Save as Collision. This will assign the collision of those brushes to the mesh (double-click the mesh in the generic browser, and hit the pink box to see the collision). If you have a complicated mesh, you may want to build collision that is simpler, to help with framerate.